Living at West Hall ensures a warm, safe and friendly environment, with first class facilities to make you feel at home in our care. Built to a very modern specification, West Hall is a care home providing a climate of freedom, choice, dignity and security. Our residents live in small groups in three newly built, unique and contemporary residences radiating out from the beautifully refurbished 18th century Manor House. Our three sedum roofed residential buildings are surrounded by nature and offer a truly unique living environment. 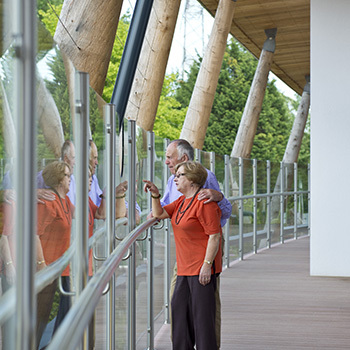 Named Oak Lodge, Maple Lodge and Birch Lodge, each of our luxurious residences is managed and run by their own teams offering unique services for a range of needs. Oak Lodge and Maple Lodge provide supported living environments for people over the age of 65 who value their independence but may require support with day to day activities such as help with personal care, medication management, or simply just for someone else to do the cooking. Birch Lodge is devoted entirely to residents with Alzheimer’s and other forms of dementia. As in Oak and Maple, residents receive support with the activities of daily living but with a specialised focus on understanding people that are living with the effects of dementia. 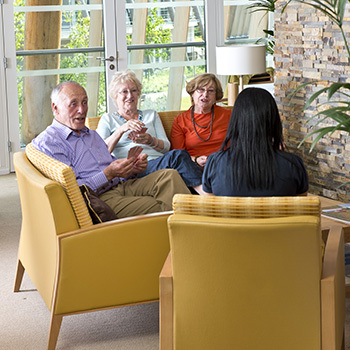 Whatever the individual needs of our residents, companionship is an important part of life across West Hall care home and the cosy lounges on each floor of all our Lodge's provide spaces where people can meet with loved ones, mingle with neighbours, read, chat or simply watch the world go by. The award-winning design of all the accommodation at West Hall improves the standard of care by giving all our residents, including those living with dementia, greater choice and dignity in their daily routine. A range of design features help residents familiarise themselves with their new home as well as create a safe environment as they go about their day-to-day activities. Each building has top of the range accessible spa baths and personal laundry facilities as well as communal dining areas enabling residents to decide where to have their meals. Our spacious bedrooms are arranged along well lit, homely hallways that have been colour-coded and use signage that is both worded and pictorially illustrated, for easy recognition. A shared charging area for personal mobility scooters compliments the communal buggy transport that is available to all residents, making trips to the Manor House fully accessible. Personal space has been an important consideration in the design of our unique residential buildings. Our bright and spacious bedrooms are almost three times the size required by national standards and have been designed to a very high standard. The fixtures and fittings in each room can be adjusted to residents’ individual needs, and all our residents, whatever their ability, enjoy the privacy of modern en-suite bathrooms large enough to enable assistance from two carers, should it be required. 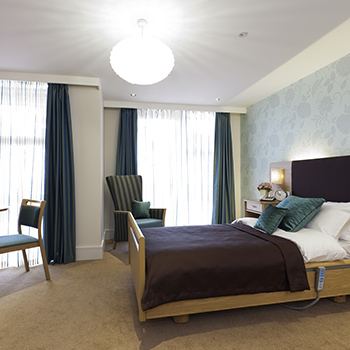 At West Hall our bedrooms are decorated to create luxurious living spaces where residents feel safe and happy. Each bedroom has its own 32” flatscreen TV and Freeview, comfortable seating, a small dining area, silent running fridge and lots of storage. We encourage our residents to personalise their room with ornaments and photos to reflect their individual style and personality and to make it home from home. Making the most of the beautiful setting, large windows and patio doors that lead onto either secure balconies or ground floor patios, enable our residents to enjoy the inspiring surroundings of West Hall from the bedrooms. Our bedrooms combine all the creature comforts of home with carefully chosen assistive technology to provide an additional sense of security. Specially adapted lights, call systems and unique sensor strips enable our staff to immediately assist residents if needed, and help our residents feel safe at all times. The range of assistive technologies we utilise are at the forefront of industry thinking and are designed to maximise independence and enable carers to create a climate of freedom, dignity, choice and above all safety. West Hall is also an environmentally-friendly home and has been recognised for the range of new green technologies incorporated into the design of our new buildings on the site. Our sedum roofed residential buildings use organic material to provide natural insulation and by installing a Ground Source Heat Pump (GSHP) system, we collect heating energy from the ground. We also utilise solar panels and have even orientated the buildings to maximise sunlight and energy efficiency. At West Hall our residential buildings are only part of our home, find out more about our stunning Manor House and the superb array of leisure facilities our residents enjoy.